Front was born in San Francisco and grew up in Berkeley. He was tall and gangling, scrawny, had trouble breathing, and could not see well. A special teacher was called in to help him attain basic competence on the monkey bars, another to privately administer standardized tests (his were three grade levels advanced from his classmates). Thusly, he was the most popular kid in his elementary school. Just kidding! He got pushed down a lot and called "nerd." Did he maybe even deserve it? I mean, really - who strikes out at kickball? He spent the next twenty years or so trying to get over it. And kind of succeeded! Flash forward to 1999: the dotcom bubble is maximally inflated; nerds everywhere imagine themselves to be popular and/or hip. Damian is getting overpaid to code web pages, which leaves him free in the evenings to play with audio software. A longtime idolizer of rappers, he has been committing his own esoteric hip-hop compositions to four-track tape since high school, revealing them to nobody. Suddenly! Multi-track desktop studios, cheap pro-grade recording hardware, skyrocketing bandwidth, semi-anonymous web publishing - these factors converge on Damian's rap hobby like a flock of winged monkeys. He posts an MC Frontalot web page, dubbing his output "Nerdcore Hip-Hop" since his audience is composed of several Star Wars figurines who live on his desk (and also random internet people who click on his MP3s by mistake). Now it is 2010. Nerdcore has metastasized into an internet phenomenon and underground touring powerhouse, with dozens of live acts and more than a hundred home-studio rhymers self-identifying within the subgenre. MC Frontalot, called alternately the movement's godfather or grandfather (thanks, kids), leads the charge, performing for thousands around the country and at prominent geek gatherings such as the Penny Arcade Expo and BlizzCon. He's been featured in Newsweek, CNN, The New York Times, Spin, Wired, Blender, XXL, XLR8R, The London Daily Telegraph, NPR, G4TV, Esquire, The Guardian (UK), The Wall Street Journal, and scores of city papers nationally and internationally. 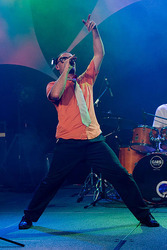 He has released four studio albums, Nerdcore Rising (Sept 2005), Secrets From The Future (Apr 2007), Final Boss (Nov 2008), and Zero Day (Apr 2010). The documentary feature, Nerdcore Rising: The Movie, which focuses on Front's live band and the Nerdcore phenomenon general, debuted at the South By Southwest Film Festival, March 2008, and is currently distributed by Virgil films / B-Side.